All of our bars are mobile and can be used for indoor or outdoor use and decorated according to the event. The bartenders, banquet and cocktail servers are dressed accordingly and serve spirits responsibly. Our drink menu is extensive and designed to ensure bride and grooms request for their guest is met. We I.D. and properly refuse the right to serve anyone professionally. Bartender Express has several wedding packages, including hosted and non-hosted bar set-ups. 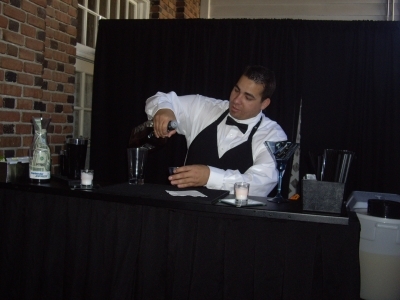 Bartender Express is a helpful mobile bar service to all brides and grooms. We offer opening & serving of the champagne toast, serving your keg beer, and specialty cocktails to your guests. No worries on who is buying the ice and tapping the kegs, we provide all equipment and staff. Whatever your event large or small/indoors or outdoors our flexible and professional service will make your special day a success.